Product prices and availability are accurate as of 2019-04-13 07:04:50 EDT and are subject to change. Any price and availability information displayed on http://www.amazon.com/ at the time of purchase will apply to the purchase of this product. Bulk MX-31NTCA Sharp Compatible Copier Toner Cartridge, Cyan Ink: CSMX31NTCA (2 Toner Cartridges) Toner for machine model numbers: MX 2600N, 3100N, 4100N, 4101N, 5001N; Color - Cyan, Yield - 15000. Cartridges are made with the highest quality components in ISO9001/ISO14001 certified factories. Cartridge meets or exceeds original printer cartridge in both print quality and page yield. Bulk MX-31NTCA Sharp Compatible Copier Toner Cartridge, Cyan Ink: CSMX31NTCA. 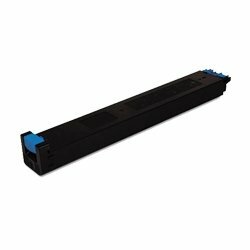 MX-31NTCA Sharp Compatible Copier Toner Cartridge, Cyan Ink: CSMX31NTCA (Qty of 1 in Cart = 2 Toner Cartridges) Toner for machine model numbers: MX 2600N, 3100N, 4100N, 4101N, 5001N; Color - Cyan, Yield - 15000. Cartridges are made with the highest quality components in ISO9001/ISO14001 certified factories. Cartridge meets or exceeds original printer cartridge in both print quality and page yield.